Slide at Hwy 9 and Redwood Gulch Road needs a retaining wall. 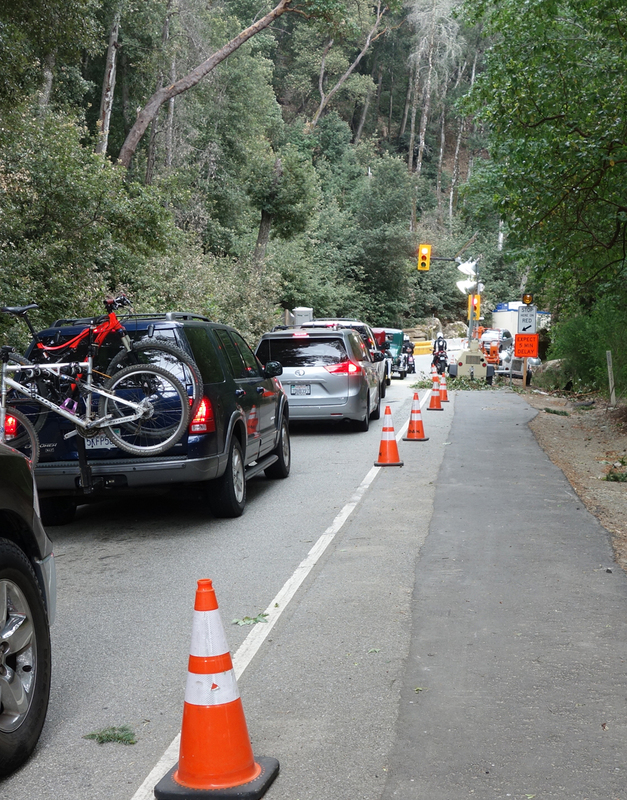 While Caltrans ponders what to do about fixing Skyline Boulevard, Hwy 9 road work goes on and on. Eventually, Saratoga to Skyline will be one big retaining wall, if this keeps up. Starting Thursday, May 11, Hwy 9 will be closed to traffic (7 a.m. to 7 p.m.) both directions at Redwood Gulch Road. I rode up Hwy 9 today and the stop light is still in place above Redwood Gulch, another location where a retaining wall is being built. 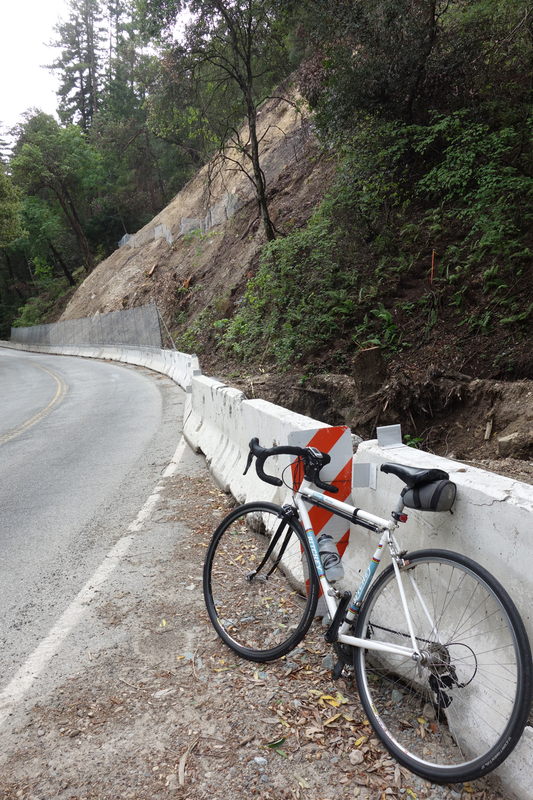 A retaining wall will no doubt be needed at the large slide (now a barren hillside) at Redwood Gulch Road. However, Hwy 236 held up well, with only one sag near upper China Grade. North Escape Road into Big Basin Redwoods State Park also survived, with only a road collapse (no dismount) at the bridge crossing Opal Creek. A couple of trees also toppled across the road, but they fell at such an angle that no dismount is necessary. As for Gazos Creek Road, the ranger I spoke with could only say that crews had been out working on the “muddy” road. I suspect it’s rideable, but muddy in spots. On my way up Bear Creek Road I rode past one stop-light repair less than a quarter mile from Hwy 9 and passed two eroded places with stop signs near David Bruce winery. Farther up on Bear Creek Road, past Summit Road, I noticed two slides have been fixed. That’s what you get when Big Basin sees 92 inches of rain in a short time span. Hwy 9 stop light several miles from summit. Expect up to a 5-minute wait. This entry was posted on May 6, 2017 at 3:19 pm and is filed under Ride reports. You can follow any responses to this entry through the RSS 2.0 feed. You can leave a response, or trackback from your own site. I rode Gazos Creek in mid March and it was fine (https://www.strava.com/activities/907068975).